The collection of short stories “I love Mary ” which has just been published (1) in a French translation, is an expression of his talent. It is uncommon, after a few months, to remember all the short stories of a collection;with this book, this will be the case . He was born in 1935 near Yilan, a small town close to the east cost of the island, southeast of Taipei. His mother died when he was only eight years old and, like the other children, he was raised by his grandparents . His studies are chaotic, he is known by many colleges for his indiscipline. But a teacher, by lending collections of short stories by Chekhov and Shen Congwen, will give him the will to write. Many jobs: teacher, electrician, radio operator in the Army, documentary filmmaker, responsible for radio programs and even manager at Nike or for the sale of mineral water. His wife, Lin Mei-yin, at that time worked for Radio Yilin on education programs in Taiwanese language. Four short stories among the most famous in this collection by Bleu de Chine, translated from Chinese and Taiwanese by Matthieu Kolatte . Hwang Chun-ming was already known in France as a result of the publication by Actes Sud in 2001, of a novella “The Gong ” in “Taiwanese Literature”, a collection managed by Isabelle Rabut and Angel Pino who have worked so hard to have this literature better known in France. Translated by Howard Goldblatt in the excellent collection, ” The Taste of Apples ” (Columbia University, 2001)(2), this text has aroused much controversy. For Goldblatt, the quality of this short story is comparable to those of Lu Xun, the great Chinese writer, or of the Canadian Alice Munro who has won the latest Nobel Prize for Literature. “I love Mary “, published in 1977, or how a Taiwanese executive of an American company , collects, for the sake of his career, the dog of his boss returning to the United States; an animal which will destroy his family life ! The author has fun but is not really involved. This is a bit of a caricature of an American couple but also of the Taiwanese characters who are mainly sketches . “Hsiao- Chi’s cap ” is a moving text with a good tempo and an elegant structure: two salesmen fail to sell Japanese pressure cookers. Wang is charmed by a young girl whose father is an officer. His clumsiness create difficulties but less tragic that the demonstration of pressure cookers made by his colleague. These last three stories were grouped in a movie and the great Taiwanese filmmaker Hou Hsiao-hsien in 1983 shot the sketch of the ad-man. As Hou Hsiao-hsien, Hwang will undertake a review of the history and culture of the island, a search for their roots. The cancellation in 1987 of the martial law imposed by the Nationalist government will allow the development of a real debate. Hwang stressed that Taiwan literature is autonomous, linked to the island and its people and not a single chapter of Chinese literature . Some nationalists consider that Taiwan became the repository of Chinese literary traditions while on the mainland, Taiwan literature is little known and judging by the tiny corner that is devoted to it in the literature museum in Beijing, not really taken seriously. 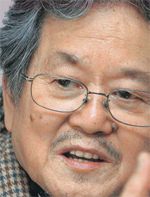 Hwang Chun-ming has not published much but still a book in 2000, ” Letting Them Go ” on the plight of senior citizens abandoned in the countryside by the youth who have left for the cities. This jeopardizes the survival of these small social units, these neighborhoods. But the center of his life is the theater and his hometown of Yilin. He creates a literary magazine about the culture of the region ” Nine Twists and Eighteen Turns ” and founded a theater for children ” Big Fish ” that keeps him quite busy as from 1993. He even wrote an opera in an effort to modernize traditional opera . His children books are successful, he creates collages that he uses as pictures for these books; four albums have been published in France in 2006. In 2003, a tragedy: the suicide of a 32 year old son, Huang Kuo-chun, with whom relations were very close. A talented child, but rather withdrawn who did not go to college but played several instruments and wrote in journals . In 2009,the French Actes Sud published by Huang Kuo-chun ” Tests of microphones ” a remarkable collection of very short texts translated by Esther Lin and Angel Pino; original developments with a lot of humor. A failed love affair may be the cause of the suicide which was particularly devastating for the parents. (1) “I love Mary “, a collection of short stories by Hwang Chun-ming. Translated from the Chinese (Taiwan) into French by Matthieu Kolatte. Bleu de Chine-Gallimard, 2014, 208 pages, € 22 . .
(2). « The taste of apples », a collection of short stories by Huang Chun-ming, translated by Howard Goldblatt. Columbia University Press, 2011, 250 pages.